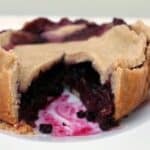 Make a delicious mixed berry pie in your slow cooker with a shortcrust pastry crust! First make up your pastry and roll it out using a rolling pin. Don't make it too thin. I used a bag of shortcrust pastry mix to save time and made it up following the directions. If you are using a ready-rolled sheet or ready-made pastry block, remove it from the fridge for the time directed on the package. I used a round 3.5 litre slow cooker to make my pie, so I ended up with a round pie, this also makes it easier to join the edges as well. Line your slow cooker pot with two round cake cases (in England you can buy these from shops like Poundland or Home Bargains). You can also use layers of baking paper/parchment. Have a third cake case ready for the next step. Place the third cake case on top of the pastry and mark out a circle which is approx. two inches larger than the cake case (or slow cooker pot) then cut this out with a knife. Drape the circle of pastry over the third cake case, place it in your slow cooker and press in the sides gently so the pastry is flat to the base and sides of the lined pot. Spoon in the strawberries and mix in the frozen berries. Make a lid using the remaining pastry and cut to size. Put on the pastry lid and dampen and crimp the edges to seal. Sprinkle the caster sugar over the top of the pie. Place a tea towel under the lid and cook on high for 2 to 2.5 hours until the pastry is cooked and no longer soft. Leave the pie to stand for approx 30 minutes before you try to remove it, using the sides of the cake cases to pull it out gently. Note regarding timings: Slow cooker baking times differ depending on your slow cooker, some of them cook much faster and some cook very slowly. You will need to look for the pastry being cooked and crisp and no longer soft, and look out for burning, to tell when your pie is done. This might take more or less time than in my slow cooker. Transfer to a plate, slice and serve with cream!